An online bachelor’s degree in music can help you transform your passion for music into a financially viable career. With on-demand streaming and music apps, individuals around the world consume more music than ever before. According to Forbes, Americans listened to approximately 32 hours of music per week in 2017, an increase from 23.5 hours per week in 2015. Additionally, the Bureau of Labor Statistics (BLS) reports that as the digital marketing industry expands, marketing agencies need more composers to write music for commercials and other advertising videos. The BLS projects that jobs for composers and music directors will increase 6% between 2016 and 2026, about the average rate for all jobs in the United States. What Else Can I Expect From an Online Bachelor’s in Music Program? 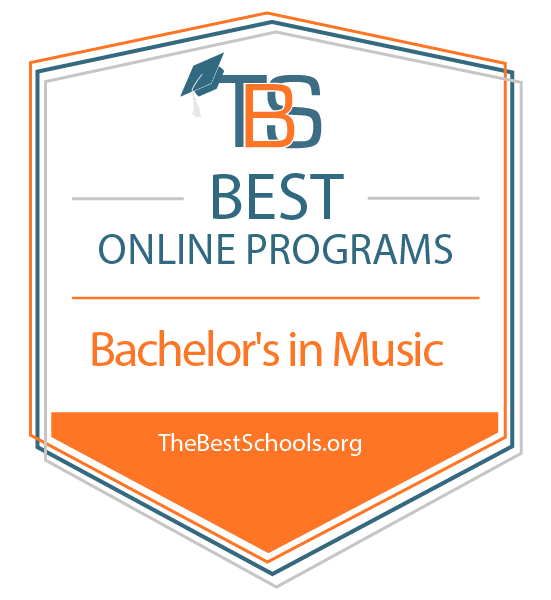 Online Bachelor’s in Music Degree Program Ranking Guidelines: We selected the degree programs based on the quality of program and range of courses provided, as well as school awards, rankings, and reputation. VCSU’s highly flexible online bachelor of arts and bachelor of science in music features concentrations in musicology, performance, theory and composition, and recording and production. The program also gives students up to 30 elective credits to customize their music degree. Students must complete a recital, production, thesis, or composition capstone in their final year. While VCSU offers all academic coursework online, students must participate in lessons and ensembles on VCSU’s campus. Alternately, learners can choose to complete these requirements on other college campuses and then transfer the credits to VCSU. Most courses feature both synchronous and asynchronous learning; students can choose to attend online classes in real-time or watch archived lectures later on. Classes mandate set due dates and exam dates. VCSU is regionally accredited by the Higher Learning Commission (HLC). Its online music program is accredited by the National Association of Schools of Music (NASM). Located in San Marcos, Texas State’s partially online bachelor of arts in music provides a rigorous education that prepares students for careers in music, education, performance, and sound recording technology. Music students must participate in ensembles and attend musical performances every semester. Texas State also expects students to participate in upper-level competency reviews, perform in senior recitals, and complete proficiency exams in piano and music theory. Prospective students who wish to pursue this online bachelor’s degree in music must complete an audition as a part of the application process. Applicants also need previous credits in math, English, science, social studies, foreign languages, fine arts, and physical education. Unless applicants ranked in the top 10% of their graduating high school class, they must submit SAT or ACT scores. Texas State is regionally accredited by the Southern Association of Colleges and Schools Commission on Colleges (SACSCOC). Berklee offers online bachelor’s degrees in music business, music production, interdisciplinary music studies, songwriting and producing music, and music composition. The college also offers specialized online bachelor’s degrees in guitar, songwriting, and electronic music production and sound design. These online music bachelor’s degrees require students to take core music classes in composition, theory, basic ear training, harmony, and piano/keyboard. Students majoring in interdisciplinary studies can design their own music major. All music students must complete a capstone project in their area of specialization. Online tuition at Berklee costs around $20,000 less per year than tuition for the college’s on-campus programs. The college also allows online students to enroll part or full time. Berklee offers rolling admissions for online students. The school accepts up to 60 transfer credits from other accredited higher education institutions. Berklee is regionally accredited by the New England Association of Schools and Colleges (NEASC). UMA’s school of music offers on-campus, online, and low-residency programs. The university’s online bachelor of music in contemporary and popular music with a concentration in music education integrates composition and pedagogy with techniques in woodwinds, strings, brass, percussion, and voice. This major prepares students to take the Praxis general exam, the Praxis music content exam, and the principles of learning and teaching exam. While the music education concentration offers mostly online coursework, students must complete their student teaching experience in Maine. UMA requires applicants to complete an audition. Students with no previous background in music can apply for the online associate in music without an audition. Students completing the music bachelor’s degree online also complete advanced studies in their instrument of choice. UMA is regionally accredited by the New England Association of Schools and Colleges (NEASC). Earning your music bachelor’s degree online involves several courses in music history, theory, composition, and advanced techniques. Undergraduates typically focus on a specific instrument or type of singing and then take several courses in this area. Most music programs require students to complete a certain number of ensemble hours each semester; these hours involve rehearsing and performing with small groups of other singers and musicians. Music majors must also take core education classes in English, math, history, and social studies. Because the music industry spans so many different occupations and genres, academic programs in this field typically allow students to specialize in a specific area. Common concentrations include composition, music production, music business, music education, and songwriting. Many programs allow students to take 20 or more elective credits so they can further tailor the degree to their interests. Other requirements may include participating in a senior recital, writing a thesis, or composing an original piece of music. Online music bachelor’s degrees vary significantly depending on the school. However, most programs cover core concepts and skill sets, including music theory, basic conducting, and music history. The section below lists more information. Music theory classes focus on reading, transcribing, composing, and analyzing music. Since most musicians and other professionals in the field rely heavily on music theory, these classes prepare students for a variety of careers. This class provides basic skills in piano scales, chords, sight-reading, harmonization, and improvisation. These skills prepare students for careers as composers, teachers, directors, producers, songwriters, and professional performers. History of music classes examine music from ancient to modern times. Students learn about aesthetics and concepts specific to various time periods and regions. The course prepares students for careers in music education and composition. Students in this course learn how to identify and notate basic rhythms, pitches, and harmonies. The class also emphasizes other skills necessary to composing and performing, including identifying different time and key signatures. This class helps students grow into more creative and skilled performers, composers, arrangers, and producers. Topics of study include harmony in contemporary music, chord progression, and improvisation. Graduates with online music bachelor’s degrees may pursue several different career paths. Many music majors continue their studies and earn graduate degrees in music or a related field. Others find jobs as music teachers for elementary and secondary schools, voice coaches, or instructors for specific instruments. A few music majors work as professional musicians and performers; these individuals play for symphonies and orchestras, for smaller bands, or for themselves as freelancers. Sound technicians work for radio stations, television studios, concert venues, recording studios, and film companies. They maintain and improve audio, video, and broadcasting equipment to ensure that events and recordings proceed smoothly. Sound technicians usually need an associate or bachelor’s degree. Composers write music for film, television, marketing campaigns, professional musicians, operas, orchestras and symphonies, and other groups. While the education requirements for this occupation vary, many employers seek composers with bachelor’s or master’s degrees in music and composition. Musicians perform for audiences, create recordings, rehearse with small and large ensembles, and spend several hours per week practicing their instrument or vocal skills. They often travel for performances. Many musicians who work for operas, symphonies, and other professional groups have at least a bachelor’s degree.